If you think a tropical cyclone by any other name would be as windy, you're right – but the name you apply to a cyclone also tells you something about where it happens. Hurricanes and typhoons are both tropical cyclones with maximum sustained winds of 74 mph or faster, but the name "hurricane" is applied to a tropical cyclone that takes place in the North Atlantic, or central or eastern North Pacific. The name "typhoon" is applied to the exact same type of storm taking place in the Northwest Pacific. Hurricanes and typhoons are the most massive, violent type of weather on the planet, measuring at least 50,000 feet high and more than a hundred miles across. One of the most interesting typhoon/hurricane facts is how they form. They only take place near the equator, where water temperatures are at least 80 degrees F, down to at least 165 feet below the surface. A tropical disturbance – the weakest stage of a tropical cyclone, usually occurring when the storm begins to coalesce – forms when wind passes over the warm ocean water. Vapor from the ocean condenses and rises as clouds with the wind circulating around them. Together, the vapor and circulating wind form a cluster of cumulonimbus or "thunderstorm" clouds, which is known as a tropical disturbance. As the thunderstorms grow larger and higher, the combination of cooler, unstable air at their tops and warm, moist air rising from the ocean acts sort of like fuel for a rocket engine, setting up a cycle where the winds in the storm clouds spin even faster. Once the winds measure 25 to 38 mph of sustained speed, the storm becomes a tropical depression. If sustained wind speed measure between 39 to 73 mph, the pattern is labeled a tropical storm, with a deceptively calm center or "eye" at the axis of the rotating winds, and it receives an official name. Did you know? Tropical storms and cyclones rotate counterclockwise in the northern hemisphere and clockwise in the southern hemisphere. The name for this phenomenon is the Coriolis effect. Once sustained wind speeds in the tropical storm reach 74 mph, it becomes a tropical cyclone, hurricane or typhoon, depending on where it occurs. Typhoons and hurricanes are graded in five categories depending on windspeed, starting with Category 1 (74 to 95 mph) all the way up to Category 5 (wind speeds of 157 mph or higher). However, typhoons with winds above 150 mph are called super typhoons. Hurricanes don't receive that extra distinction. Although "tropical cyclone" is an umbrella term that can be used to refer to hurricanes and typhoons, it has an even more ambiguous use: A typhoon-like disturbance in the South Pacific or Indian Ocean is described as a tropical cyclone, regardless of the strength of its winds. There are fairly distinct hurricane seasons in the Atlantic (from June through the end of November) and the Northeast Pacific (late May to early November). Hurricanes can occur outside these time ranges, but they're quite rare. But in the Northwest Pacific, where a tropical cyclone is called a typhoon, these storms can take place year-round. Because of this there's no set "typhoon season," although most typhoons occur between July and November, with the storms at their rarest in February and early March. Strong winds that can topple trees and buildings are just one part of what makes a typhoon so dangerous. Other hazards from any typhoon or hurricane include heavy rainfall, storm surge and storm tides, rip currents, flooding both along the coast and inland, landslides and flash flooding caused by oversaturated ground, and tornadoes spawned by thunderstorms within or near the cyclone, usually on the outer edges of the typhoon or near its eyewall. Even if you don't live on the coast, the effects of a typhoon can reach more than 100 miles inland. If you're in a typhoon or hurricane, one of the most important things you can do is pay attention to warnings beforehand and notices to evacuate, especially if you live on low ground that is subject to flooding. Even if you live on high ground that won't flood, you might find yourself – along with your electricity and any other utilities – cut off once the storm strikes and water levels rise. The names for typhoons aren't random. Potential names are contributed to a central list by countries in the region where typhoons can take place; the names must be short, distinctive and relevant to the region. The name for each typhoon is then chosen by the World Meteorological Organization's Regional Specialized Meteorological Center in Tokyo. If a storm is particularly destructive that name is retired and won't be used again; this is why there will never be another Super Typhoon Haiyan, which struck the Philippines in 2013. Haiyan (which was known in the Philippines as Yolanda) was classified as a super typhoon because its sustained wind speeds reached 195 mph. In 2015, Hurricane Patricia became the strongest tropical cyclone on record, with sustained winds of 200 mph. Until then, Super Typhoon Haiyan held that record. Although Patricia was technically stronger, it struck a relatively unpopulated area in Mexico, and its winds, though very strong, were confined to a relatively small area. So Haiyan was much more destructive, killing more than 6,000 people, injuring almost 30,000, and causing more than 2 billion American dollars of damage in the Philippines alone. 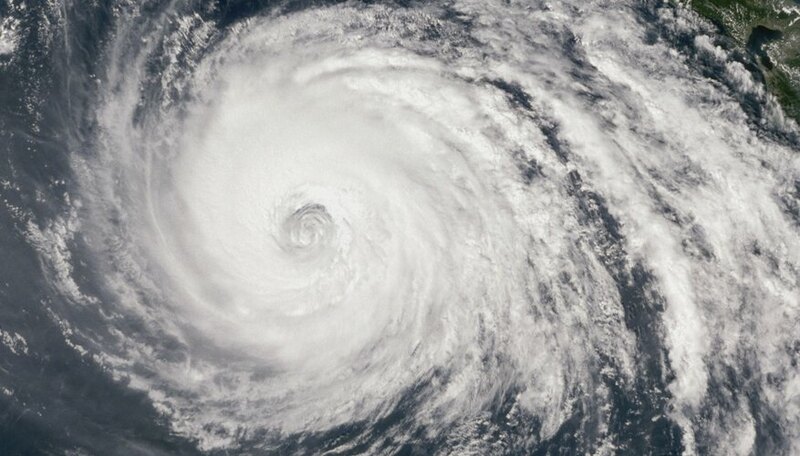 National Ocean Service: What Is the Difference Between a Hurricane and a Typhoon? NOAA SciJinks: How Does a Hurricane Form? Encyclopaedia Britannica: How Are Hurricanes and Typhoons Named? Central Weather Bureau: 5. How Is a Typhoon Named? Decoded Science: Haiyan: A Super-Duper Typhoon... Also Known as Yolanda? Maloney, Lisa. "Facts About Typhoons." Sciencing, https://sciencing.com/typhoons-5479398.html. 24 September 2018.